The Caterham F1 team has been sold by owner Tony Fernandes to a Swiss and Middle Eastern consortium. The new owners will be advised by former Midland and HRT team principal Colin Kolles, and they will continue to race under the Caterham name. Former Dutch F1 driver, Christijan Albers, will take over the running of the team, assisted by Manfredi Ravetto. "We are aware of the huge challenge ahead given the fight at the bottom end of the championship," said Albers. "Our target now is to aim for 10th place in the 2014 championship. "We are very committed to the future of the team and will ensure it has the necessary resources to develop, grow and achieve everything it is capable of." Both Caterham drivers, Sweden's Marcus Ericsson, and Kamui Kobayashi of Japan, have failed to collect a point from eight races and the team are last in the Constructors' Championship. Malaysian businessman Fernandes, who is also the chairman of Premier League club Queens Park Rangers, entered F1 four years ago with what was then called Lotus Racing. The Oxfordshire-based team's name was changed to Caterham in 2012 after Fernandes bought the manufacturer of lightweight sports cars. Caterham F1 will now have no links with the rest of the Caterham Group, which is still owned by Fernandes and comprises two technology companies as well as the car manufacturing arm. Frenchman Cyril Abiteboul, who Fernandes had employed as team principal, has left the team and is reportedly returning to work for Renault Sport. Lotus/Caterham finished 10th in the championship for their first three seasons but finished 11th last year. If they fail to finish in the top 10 again this season, it will cost them millions of pounds in prize money. 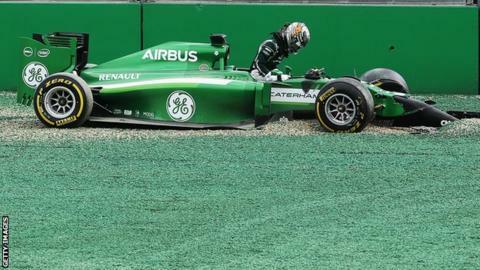 Fernandes' decision to sell Caterham F1 was based on their failure to improve their performance. On Friday, Fernandes wrote on his Twitter account, which has now been closed: "F1 hasn't worked, but love Caterham Cars."